It has been my experience that men are commonly intimidated by giving jewelry Christmas gifts to their special lady friends. I’m not quite sure if it is the fear of the price tag that is frequently associated with buying beautiful pieces of jewelry, or if men are simply terrified of selecting an exquisite piece as a gift. Whatever the reason, just stop right there. Take a deep breath, relax, and trust me. Shopping for jewelry Christmas gifts for women isn’t really all that bad. In fact, it can be quite fun, if you know what you are doing and where to shop! And the best part about shopping for beautiful necklaces, earrings, and bracelets with me is that you don’t even have to leave home. That’s right! No fussing with the overly enthusiastic sales person at that crowded jewelry store in the mall, no circling the block downtown in search of parking, and no fainting when you see our prices. See? I told you it was a piece of cake! Now kick back in your recliner and get your feet up, get your laptop in position, and let’s get started. Have you ever hear the saying “The early bird gets the worm”? Well that isn’t always so. There is no need to rush into these things you know. If you’ve waited until the last minute (Really? Again?) to shop, never fear. 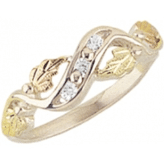 ChristmasGifts.com is here with some last minute jewelry gifts she is sure to adore. Check out the Black Hills Gold & Silver CZ Ring that can be ordered as late as December 10, 2015 for arrival in time for Christmas. Is it time to make that promise to that special lady in your life? There is no better time than now to reveal your undying love and seal it with a promise. Celebrate the season with this dainty personalized sterling silver promise ring. If you are searching for a unique Christmas gift for the mother of your children, or even your own mom this holiday season, this Family Pearl Pendant Necklace cannot be beat. 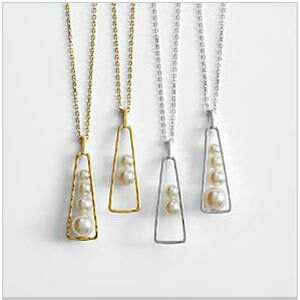 With each delicate pearl representing a child, this beautiful necklace is certain to touch that special mom’s heart. These sterling silver leaf hook earrings are sure to be the talk of the town this Christmas and for years to come. The perfect Christmas gift for your girlfriend, wife or even your fashionable mom, these earrings are certain to add a sparkle to any lady’s day. If that special lady in your life already has five golden rings this holiday season, consider presenting her with a personalized jewelry box instead. We have a nice assortment to choose from, and they all have enough room to store her most valued possessions. See? Now that wasn’t so bad! Do you still feel intimidated by giving jewelry Christmas gifts?